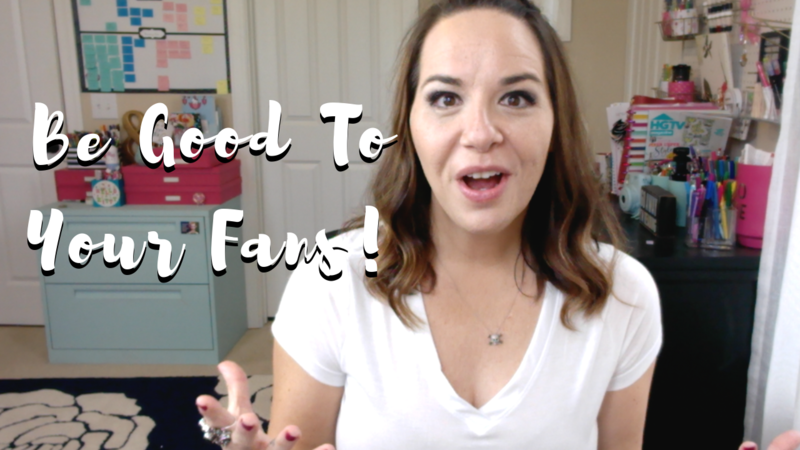 I couldn’t have a list of my top lessons learned over eight years of self-publishing without talking about why it’s important for writers to be good to their fans. This one has the potential to be controversial, simply because many authors have strong opinions about this one way or the other. One of the things I hear quite often from indie authors is that this is a business and we shouldn’t be bothered trying to cater to the whims of our fans. Okay, that’s true in a way. This is a business for most of us, and we do need to make decisions that will help us grow our careers and income as writers. That’s definitely true. It’s also true that fans will often want us to do things that aren’t in our best interest (or even possible!). Write faster. Write a different ending to our story. Write more of one genre instead of another. Write a side novel about the kids of a certain couple they love twenty years in the future :P.
Being good to your fans does not mean you have to run your whole career based on every email or request. That’s not what I’m talking about here. What I’m talking about is being respectful of the people you are serving with your fiction. Without loyal fans who were willing to take a chance on our books, we wouldn’t have a career to begin with, and I firmly believe this is something we should all be taking into consideration whenever we make big decisions that will affect our fans. While we can’t cater to every desire of every fan we have, it’s vital that we respect our fans and do what we can to make sure we are not actively treating them poorly. Sometimes what might seem like a good business decision to gain visibility or extra income ends up actually being something that screws over a large portion of your fanbase. Abandoning a series that isn’t selling all that well might be the best thing for your business, but if you leave that series on an eternal cliffhanger with no resolution, you need to be aware that a portion of your fanbase is going to be left totally unfulfilled. Sometimes tough decisions will have to be made. Heart breaking decisions. I totally get that. This is not an easy business. However, when possible, I strongly urge you to at least take a moment to consider your fans before you make decisions that will affect them. A good way to do this is to put yourself in the position of a fan. How would it make you feel if a business treated you this way? What if an author you loved did this? This is a good practice to follow no matter where you are in your journey, whether you have thousands of fans or none. If you can start your career treating those who support your work with respect, you will garner a more loyal, devoted following over time than an author who consistently angers or treats her fans poorly. The truth is, being good to your fans really doesn’t take a lot of work. At minimum, you should have some kind of home on the internet where fans can find information about your books or upcoming releases. A simple website or Facebook page, linked in the back of your books, is perfect for this. Posting regular updates keeps loyal fans in the loop and lets them know you care about them and want to keep them updated. Other than that, all you need to do is consider how your decisions will affect them. If you have to make a decisions that will negatively impact your readers (like totally switching genres or abandoning a series, making a difficult pricing decision), go to them and let them know ahead of time what you need to do and why. It’s always up to you, of course, how much you want to share, but just respecting your audience enough to communicate with them is important. This all plays into my tip about thinking long term. It’s all good to want to make money in the short term, but if you don’t consider how your decisions might affect your fans in the long run, you might be hurting yourself more than you know. So, when you can, be good to your fans! And if you want to take this a step further, do what you can to foster community among your fans. A Facebook group or an active website can be golden for this. Giveaways. Discussions. Facebook Live videos. Blog posts. Teasers. All of these can be valuable tools for keeping your fans engaged and making them feel like they are a part of something big. Create A Writing Plan That Helps You Hit Your Deadlines! Subscribe now to download this Writing Plan and Scheduling page. Set deadlines and track your progress as you write your novel! If you're anything like me, you constantly feel behind and yet, you continue to procrastinate! Looking ahead, setting goal dates, and keeping track of your schedule as you write is one way to stay motivated and on target.